India's government has quietly shelved a controversial amendment to its citizenship law after violent protests in the north-east of the country. The bill was aimed at helping Hindus and other minorities move to India from neighbouring Muslim-majority countries. The legislation cleared parliament's lower house but the ruling BJP failed to enact it in the upper house, which ended its term without hearing it. The move marks a major about-turn ahead of general elections due by May. Bharatiya Janata Party (BJP) president Amit Shah told a rally as recently as last month the bill would be pushed through regardless of protests. The bill sought to provide citizenship to non-Muslim migrants from Pakistan, Bangladesh and Afghanistan. Supporters of the bill defended it by saying Muslims were excluded as the bill offers Indian nationality only to religious minorities fleeing persecution in neighbouring countries. The protests have been particularly vocal in the state of Assam, which recently saw four million residents left off a citizens' register. The National Register of Citizens (NRC) is a list of people who can prove they came to the state by 24 March 1971, a day before neighbouring Bangladesh became an independent country. Around 3.62 million of those left off the register have submitted claims for inclusion. How bad were the protests? In Assam, offices of the BJP, which runs both the federal government and Assam's state government, were burnt down by angry mobs in many places. Thousands of students joined writers, artists and activists in regular protests against the bill, fearing that tens of thousands of Bengali Hindu migrants who were not included in the NRC would still get citizenship to stay on in the state. The unrest also spread to neighbouring states and many people have been injured. In Manipur, the authorities declared a curfew and cut internet access as large crowds of protesters took to the streets in recent weeks. Six women were seriously injured in the state on Sunday, when police fired tear gas shells at a group of protesters. 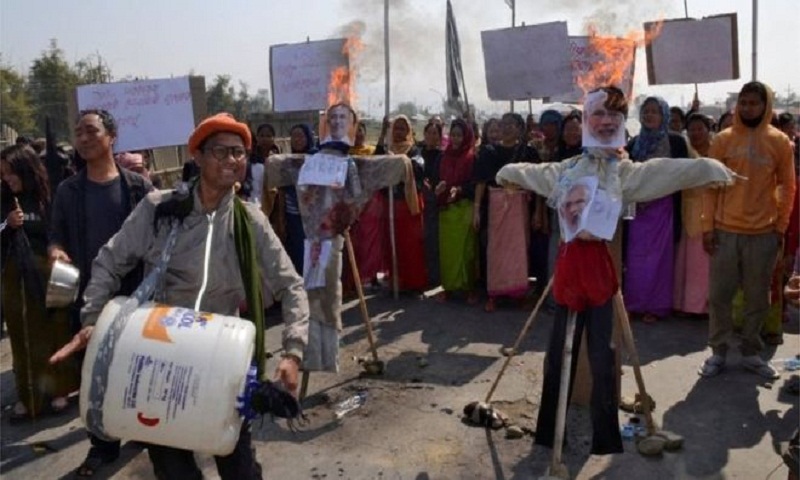 Effigies of Prime Minister Narendra Modi were also burned by protesters, with some even conducting mock funerals for him.